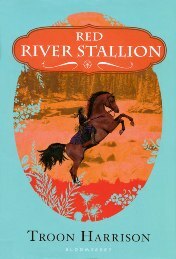 When a young orphan named Amelia first sees a red stallion she is sure he is her spirit guide, but learns the beautiful horse has come to York Factory by ship on its way to the Red River Settlement. Amelia must decide whether to stay with her mother’s tribe or accompany the stallion on his journey, in the hope that the father she has longed to meet might be found at their destination. This book is a good book because it’s about a girl who wants the horse to look for her father. This book is a great book. I love this book because it is so sweet.